As a lover of watches I look for a few things. First I look for complicated movements – the guts inside the watch – and second I look for interesting design. These watches, the KLOK-1 and KLOK-2, fit the bill. Designed to look like a slide rule and a clever “fuel gauge” model, both watches use custom-made quartz motorized movements to display the time. The watches cost about $400 for early backers and come in multiple styles and colors. The watches can be removed from the bands and work as pocket watches or you can clip it to a notebook or jacket pocket. 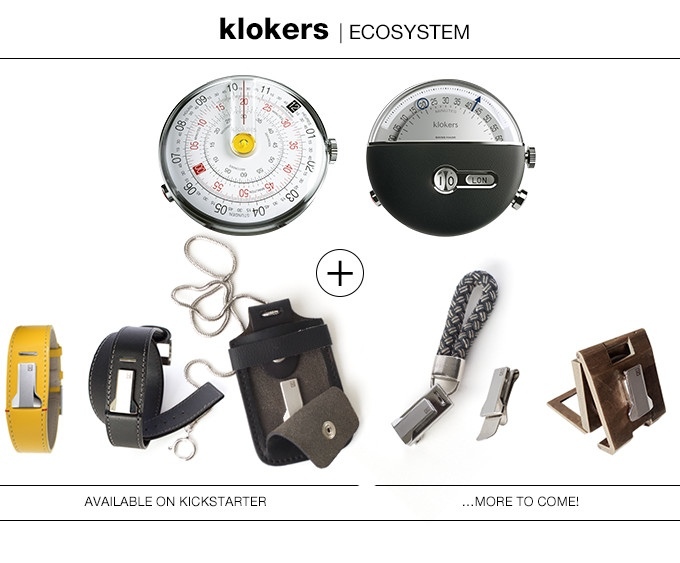 The creators, Nicolas Boutherin and Richard Piras, are based in Geneva and designed the KLOK’s to be decidedly unique. The KLOK-1, for example, “is composed of three circular discs sliding past each other at different speed” while the KLOK-2 uses a retrograde hand to show the time as well as a window for other timezones. These complications are quite difficult in practice but because they are actually using micromotors to run the hands they will be less expensive and more accurate than mechanical movements. They’ve already raised over half a million dollars after asking for a mere $56,000 so there’s a good chance you’ll be seeing your watches when they ship in February.